Today's corporation succeeds based on its ability to establish and sustain a network of strategic business partners. "Do what you do best and outsource the rest" is the credo. Our developers possess extensive knowledge and experience with many areas of information technologies. They have participated in several international projects, they are able to work towards deadlines, have project management skills, and experience in working in international teams. In the field of e-Government and e-Democracy we provide complex solutions to increase efficiency and transparency of communication process between citizens and institutions. Quality of our solution was proved in international projects with EU support. InterSoft, a.s. is a research partner in the VICINITY H2020 EU project. 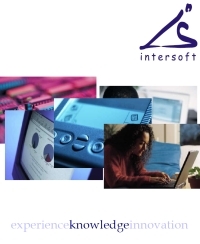 InterSoft, a.s. is a user and research partner in the VENIS ICT FP7 EU project. InterSoft, a.s. is a research partner in the EBBITS ICT FP7 EU project. 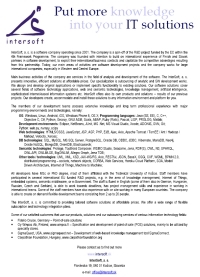 InterSoft, a.s. is a user and research partner in the ELLIOT ICT FP7 EU project. InterSoft, a.s. is a research partner in the OCOPOMO ICT FP7 EU project. 2015 © InterSoft, a. s. All rights reserved.